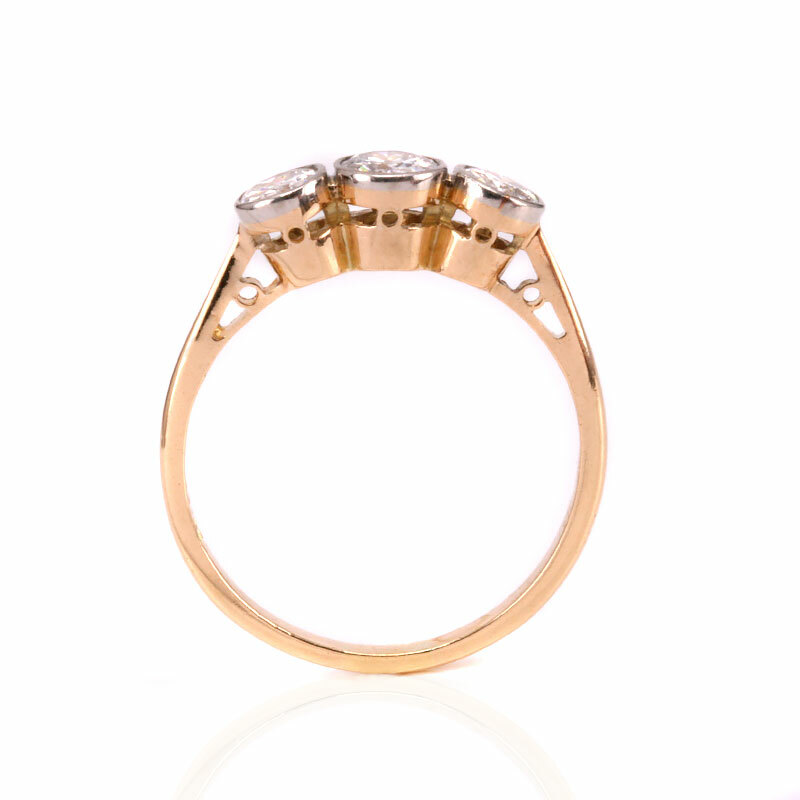 Product code: ES8378 Categories: Art Deco, Art Deco Rings & Art Deco Engagement Rings. 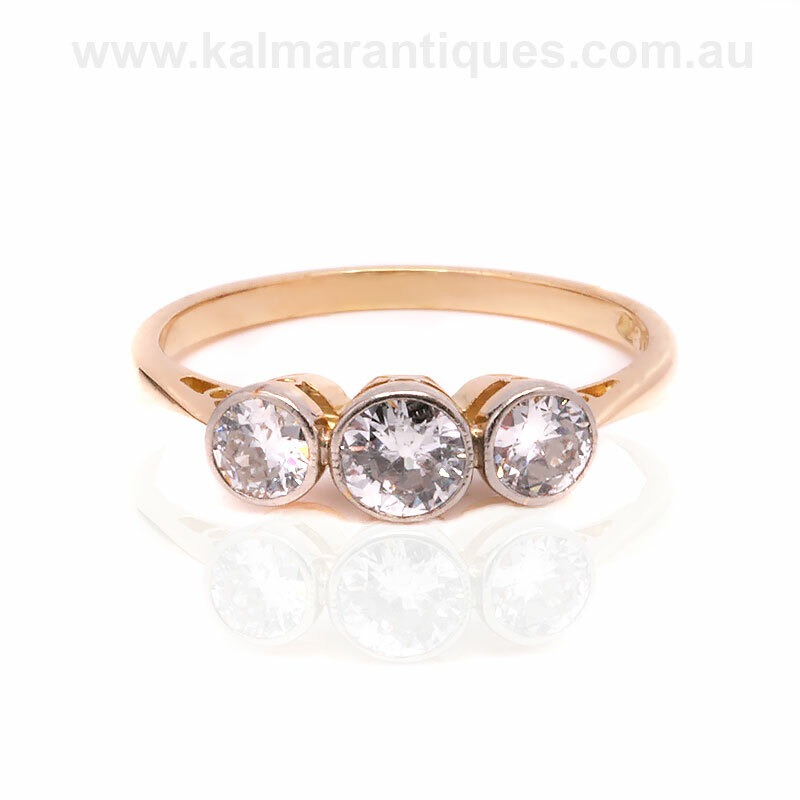 Here is a perfect example of a genuine vintage Art Deco 3 stone diamond engagement ring that was hand made in the 1920’s and looks as beautiful today as when it was made. This is a style of engagement ring that is still so fashionable today and this particular one was made in 18 carat yellow gold and platinum. In the centre is a lovely early brilliant cut diamond that measures 0.38 carats and the two side diamonds total 0.50 carats and all three diamonds sparkle magnificently. Even the setting around each diamond is so elegantly made in platinum which is such a beautiful pure white metal that was especially popular during the Art Deco period when this ring was made. Able to look so elegant on its own or sitting next to a wedding band, this is the perfect example of a genuine Art Deco diamond engagement ring that will always be loved and admired for its elegance and beauty. Tags: Art Deco Diamond Engagement Ring, Art Deco diamond engagment ring, Diamond Engagement Ring. This vintage Art Deco diamond engagement ring is hand made in 18 carat yellow gold and platinum. Set with three early brilliant cut diamonds that total 0.88 carats, it shows why genuine Art Deco rings make the perfect engagement ring.